At the far end corner of Ta Phin village is Hang Ta Phin or Ta Phin Cave. As usual, with the commercialism of tourism, expect Red Dao women waiting there to promote you and plea you to buy their merchandises. Beside, the Dao children also surrounded us to rent us the torch light. The problem was there were a few of them persuaded you to rent from them, so Adeline did have a hard time figure which one to rent. The torch normally cost VND 2,000. 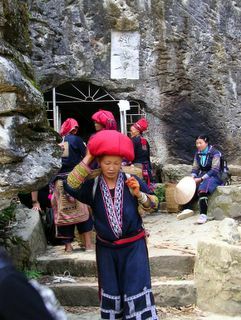 Note: The Red Dao is easily identifiable by the large red headdresses worn by many of the women. Hang Ta Phin is just a small and unimpressive cave, and it's completely dark inside. Bring a torch, else make sure the torch light is bright when renting one.